Something I’ve never asked for in life is a movie trailer that takes three minutes and 44 seconds to watch - and yet that’s exactly what Sony Pictures has just released to promote Neill Blomkamp’s upcoming sci-fi action flick Elysium. It’s hardly a surprise, as nearly every Elysium trailer has pushed beyond the average 2:30 mark, but this is pretty ridiculous. I’m one of the people that cannot wait for this movie to be released, yet I’m getting more and more exasperated by the amount of promotional materials that are being released. Though it doesn’t necessarily prove my point, the above extended trailer is morethan half as long as Alive in Joburg, the 2005 short Blomkamp directed that ended up becoming the source material for his breakout hit District 9. Again, I can’t wait for Elysium, so I’ll save all my naysaying for a film of lesser-appearing caliber (speaking of caliber, Matt Damon sure is shooting a lot of guns in this trailer). The set up and pacing of the trailer are quite similar to the other extended trailer that was released last month, only with another 25 seconds or so of new footage spliced in. A good chunk of that extra time is put together from Adrian Holmes’ character Manuel showing Matt Damon how to work his weapons, one of which he tests out against a robot drone. This is what becomes of it, following a multi-angle Michael Bay-style explosion. It’s pretty impressive. The only other noticeably important addition to this trailer is a short bit where Sharlto Copley’s mercenary character Krueger is walking down a corridor hollering, “I will find you! I will hunt you down!” as the lights go haywire all around him. I know that Jodie Foster’s clean-handed Secretary Rhodes is the real villain of this movie, but I hope that the imposing Krueger is a formidable side baddie, as wasting that kind of badassery is a mistake only made by lesser filmmakers than Blomkamp. 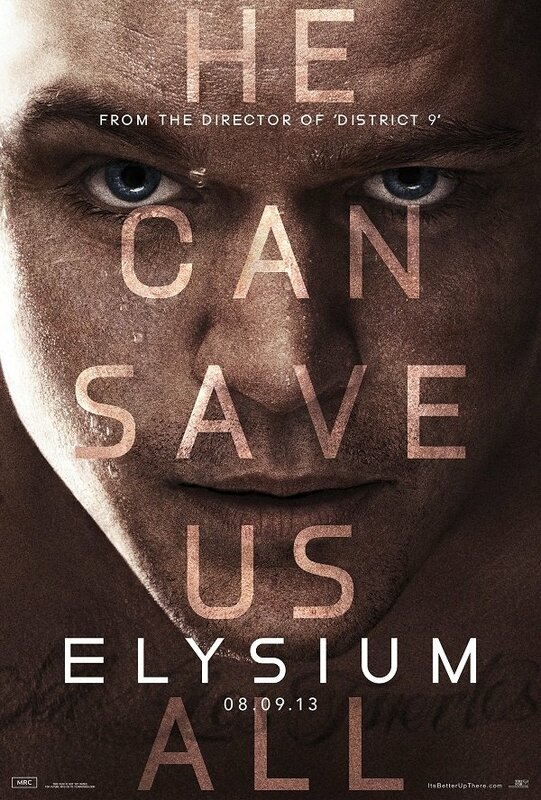 Elysium will hit local and IMAX theaters on August 9th. One has to wonder what kind of trailers will be seen before it. Perhaps a five-minute clip from Gravity? We’ll see. Until then, check out a recently released clip from Elysium below as well as a brand new poster.